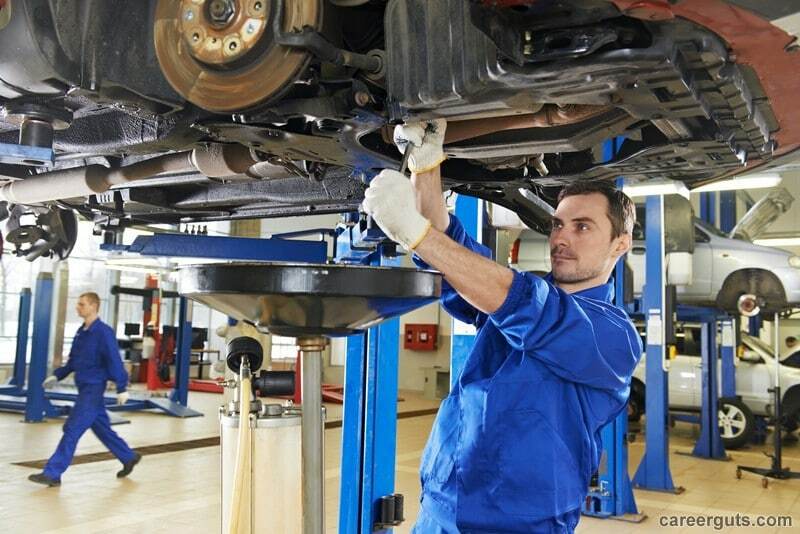 The car mechanic works in different types of companies: small traditional garages, repair centers, car dealerships, administrations, companies with their own fleet of vehicles, car rental agencies, road transport companies or public transport companies. He works alone or in a team in a workshop, often in strenuous physical positions to access the various parts of the vehicle. A mechanic must not be allergic to solvents and lubricants and must be able to deal with gasoline vapors. The automotive services business, which includes marketing, maintenance, and after-sales service, remains dynamic. Many positions need to be filled in maintenance (bodywork, troubleshooting, mechanics, etc.). Obviously, the pressure of the positions, the mechanic work environment, and career prospects, encourage mechanics to work hard. Analytical and observation skills, skill, precision, rigor, and method are essential for this job. The sophistication of vehicles requires an increasingly high level of knowledge in mechanics and electricity. In some cases, the car mechanic may use the technical documentation published by the manufacturers. The technological evolution of motor vehicles continues to accelerate and it is therefore essential for garage owners to know the technical information and to acquire increasingly expensive equipment. One of the advantages of an independent garage is the welcome of the customers. Indeed, the shop owner often knows his customers as well as the history of the car. He is more available to explain the problem and to give personalized advice. Auto centers are specialists in parts. These are the specialists in exhaust, suspensions, brakes, gimbals, oil changes, revisions, and battery changes. In terms of employment, hiring is rare in the production sector. 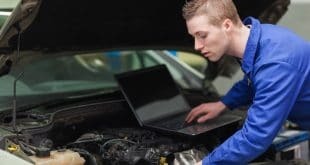 The activity of the profession is carried out by repair companies, garages, and car dealers, in relation with different stakeholders (customers, etc.). It varies according to the sector (passenger cars, industrial vehicles, etc.) and the type of structure (craft company, garage, dealer, etc.). It may also involve traveling. Wearing protective equipment (gloves, safety shoes, etc.) is required. A car mechanic may work on weekends, public holidays and at night. Work can involve strenuous positions and loads. The work is messy and requires wearing a suitable outfit. Also, the working conditions in independent garages or franchisees are sometimes uncomfortable. In the event of a breakdown, the mechanic makes a diagnosis to find out the cause. The automobile mechanic is responsible for the maintenance, repair, and adjustment of motor vehicles. Current maintenance consists of checking the various parts of the vehicle, replacing certain wear parts, performing oil changes, checking the level of the coolant, examining tires and brakes, shock absorbers, belts, etc. A mechanic can perform troubleshooting outside and towing vehicles that are broken or damaged. Then he organizes repair work: disassembly and replacement of defective parts, repair of damaged parts, tuning and adjustments, garage or road tests. He listens to the customer’s specifications and carries out tests on mechanical, electrical or electronic components. Also, he can be in contact with customers and advise them on the purchase of accessories. After identifying the source of the failure, he evaluates the work and draws up a quote. A mechanic may implement a computerized data collection system allowing the setting up of a perpetual inventory. A mechanic may adapt a vehicle to meet standards. A mechanic may also recommend new processes to optimize operations efficiency, process safety and production efficiency. A mechanic plans tool maintenance and maintenance programs. A car mechanic may also install additional equipment (devices, protection, tinted films, couplings, etc.) on a particular motor vehicle, replace windows or repair impacts and cracks, sort recovered components and fluids (batteries, hydrocarbons, lubricants, etc.) and direct them to a treatment or a storage area. A car mechanic may also work on delivery vehicles (tailgate, bulk goods, refrigeration, etc. ), on cleaning vehicles (refuse dumpsters, etc. ), on armored vehicles and equipment, on vehicles transporting dangerous goods, on passenger vehicles (coaches, buses, etc. ), on public works vehicles and equipment (cranes, dumpsters, mixers, etc. ), on light vehicles and on heavy vehicles (semi-trailers, etc.). A car mechanic may also work on a biofuel engines, on diesel engines, on natural gas engines, on electric motors, and on gasoline engines. A car mechanic may also work on a motorhome. A car mechanic may also carry out a road test of a particular motor vehicle or an industrial vehicle. A car mechanic may also perform on-site troubleshooting or towing of a particular or industrial motor vehicle. A car mechanic may also carry out a technical inspection on a particular motor vehicle or an industrial vehicle. Next How Much Do Mechanics Make?